* These enchanting 1 1/8" h vintage wedding earrings feature gracefully etched pave Cubic Zirconia flowers plated in silver rhodium. 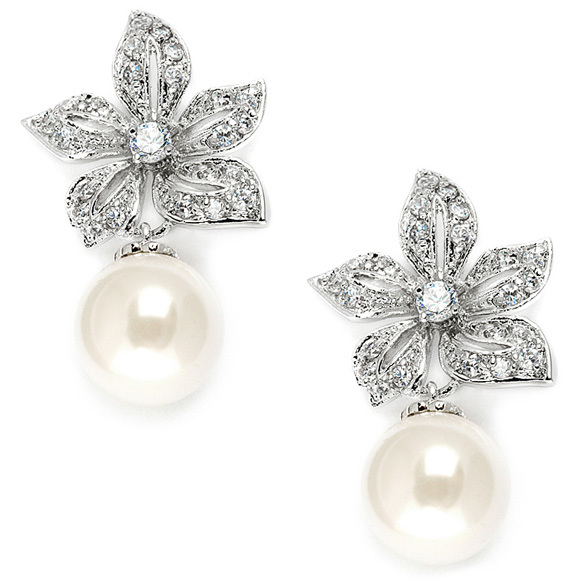 * They have a luxurious 10mm soft creme round pearl drop to add retro sophistication to any wedding or special affair. * Mariell's wholesale wedding earrings have a coordinating necklace (3640N) and ring (371R) sold separately, so you can offer your customers a complete jewelry ensemble.